Strong neodymium block magnets with a coloured plastic coating. 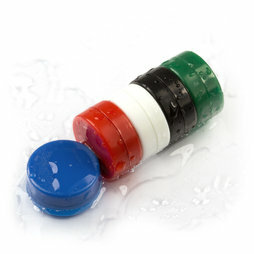 The plastic covers the magnets completely, so they can be used in wet surroundings without rusting. Also, the plastic protects sensitive surfaces such as whiteboards from scratches. That's why these magnets are the ideal office magnets: Small but strong, colourful and reasonably priced. On these magnets the casting seam is clearly visible, which is a little unaesthetic but attributed to the conditions of production and not a material defect.